Is the second most populated city in Spain, and the sixth of the European union. It’s located next to the Mediterranean Sea, about 120km from the south of the Pyrenees and the French border. 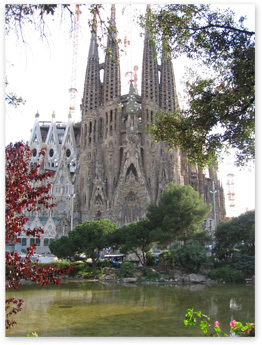 Barcelona has been the stage of many different kinds of international events and expositions. In 1888 there was the universal exposition, in 1929 the international one. In 1992 the Olympic games and on 2004 the international culture forum. 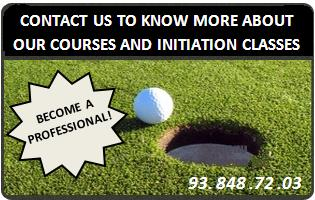 It’s considered a global city due to its cultural, financial, commercial and touristic importance. It is a public park with gardens and architectonic items located on the top part of the city. 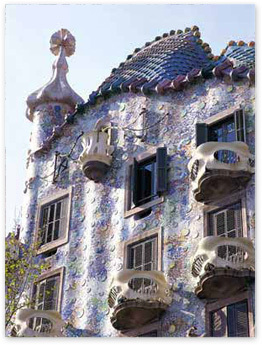 It was designed by Antoni Gaudí and built between 1900 and 1914. Its inauguration was on 1926 and on 1984 the UNESCO recognized it as an humanity heritage. 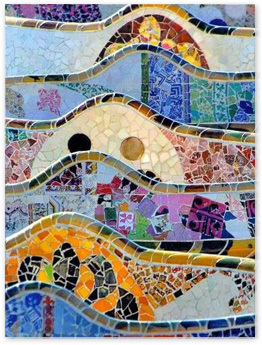 Is one of the principal evidences of Barcelona, and one of the most famous avenues of Spain due to its fashion shops, business areas and architectural buildings from Antoni Gaudí, Lluís Domènech I Montaner. It is located in the central part from the city, and connects the Spain square with the big Gracia’s street. 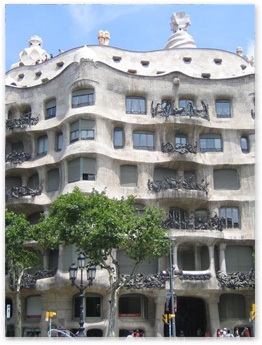 Is a building designed by Antoni Gaudi, built between 1904 and 1906. It is a completely remodeling of a previous building designed by Emili Sala Cortés. It’s located in the number 43 of Passeig de Gràcia, in the discord apple. It has this name due to there are other modernist buildings from other architects like the house, the house, the house Casa Mulleras, and the house Josefina Bonet. 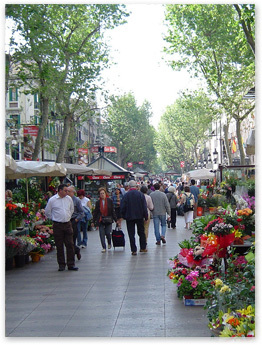 Is an emblematic stroll of the city that goes from Catalonia square to the old harbor. It’s usually full of people night and day, and there are so many kiosks and flower shops, restaurants and street actors. Close to the harbor there are usually some small markets and painters. Walking through the ramblas there are some interesting buildings such as the Virreina palace, the Boqueria market ands the famous theater the Liceu, that you can appreciate. One of the side streets conects the Rambla to the Reial square, which is decorated with coconut trees and gull of Beer bars and restaurants. It is a stroll with diferents parts called the Rambla de Canaletes, Rambla dels Estudis, Rambla de Sant Josep, Rambla dels Caputxins, and the Rambla de Santa Mònica. 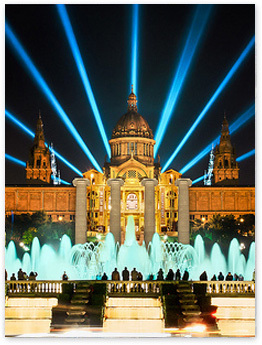 From Plaza Espanya you can arrive to the Maria Cristina avenue where there’s the magic or Montjuic’s fountain, the national Catalan art museum, a bit higher the Spanish village, the Olympic ring, and finally the Montjuic’s Palace where you can have an amazing views of the city. The magic fountain is one of the most attractive touristic points, because at night it offers a water and lighting show from the palace to the Spain square. There are fountains, ponds and lighted columns all along the Maria Cristina avenue. The shows are usually from Thursday to Sunday at: 21h/ 21.30h/ 22h/ 22.30h / 23h. 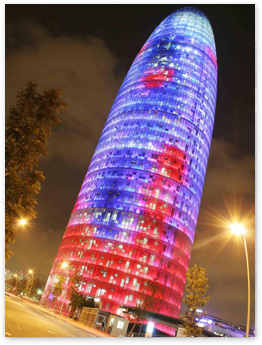 This tower is a skyscraper located between diagonal avenue and Badajoz street, close to the “les glories” square. You should visit it at night because it gets lighted for some hours in different colors. This Building has a surface of 50.693 m2, 30.000 of this ones are offices, 3.210 technique installations, and 9.132 parking. 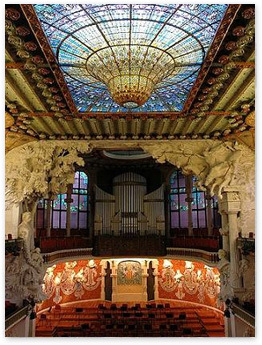 Is a music auditorium located in the Sant Pere Street in the Ribera’s neighborhood. The architect Lluís Domènech I Montaner was the one who founded the project. It was constructed from 1905 to 1908, and on 1997 the UNESCO recognized it as a humanity heritage. 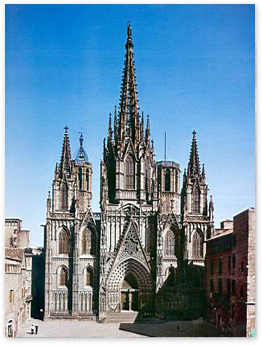 It was built between XII and XV century ,on the old Romanesque cathedral, built in turn on a Visigoth church which was preceded by an early Christian basilica, whose remains can be seen in the basement, at the Museum of History the City. The building is a Cultural interesting point, and from the November 2, 1929 a National Historic-Artistic Monument. It is dedicated to the Holy Cross from the year 599 and was added after the year 877 to Santa Eulalia, the patron of the city (now instead, is more celebrated the Virgin of Mercy).